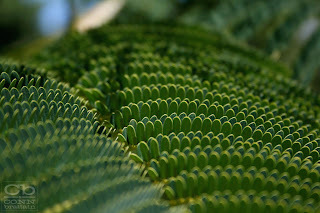 Leaves of the ROYAL POINCIANA tree. mmm, i love staring at the close up of this - very calming and zen. and the rows remind me of the surfboard fence in Haiku. it is very calming for me too. too bas the tree is almost bare now. it's a winter shedder... leaves coming back in may blooming in june.